or those who are not yet familiar with the website, www.dailydropcap.com, a website by designer and illustrator Jessica Hische, is quite fun to explore. The project is simple enough. 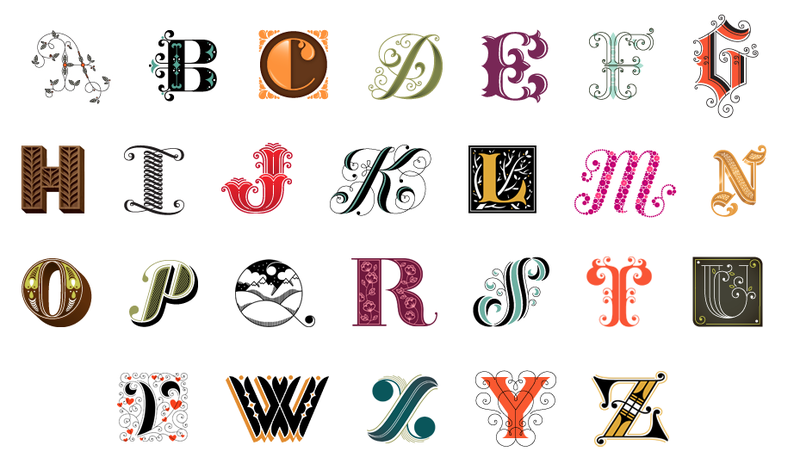 Starting in September of 2009, Jessica designed a new drop cap every day, creating a total of twelve alphabets, as well as an extra by guest designers. The results are delightful. Nothing matches or creates a set, but the variety is part of the charm. It’s also a great place to browse to get ideas for different type styles, and you can tell as time went on that she was forced to get more and more creative for her different letters—they start off looking like more traditional, ornate, scripty drop caps, and slowly get more and more creative, branching out to more illustrative and unusual concepts. ome of her style tags include: Badass, Botanical, Circus, Contained, Dimensional, Girly, Graphic, Guest Alphabet, Highly Illustrative, Holiday, Monoline, Retro, Script, Seasonal, Silly, Swashy, Tattoo, Uncategorized, Victorian, Wood Type-esque. Have fun exploring! And enjoy another great aspect of her project: all of these drop caps have been created so that the public can use them for free on their own (non-commercial) websites. Pretty awesome. essica Hische has been coming to my attention more and more lately. I’ve been checking in semi-regularly to her new site, typesf.org, where she keeps a calendar of typography events in San Francisco (she recently moved from Brooklyn to the beautiful Bay Area—I’m going to be keeping my eye out for her at design events!). She also is the creator of the fantastic and informative poster “Should I Work For Free?”. The original online version (“Since I am a crazy person and we are all nerds, this chart is entirely css and html”) can be found here, or you can order a beautiful letterpress version from her website. I’ve enjoyed exploring her regular website (as well as dailydropcaps.com), and just seeing what sort of projects she’s worked on. Seeing what other designers are doing in our field is always inspiring.